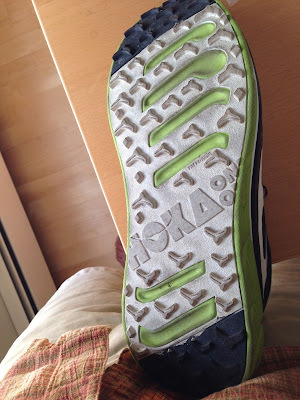 Road Trail Run: First Review: Hoka One One Rapa Nui Trail Runner, Road Too! First Review: Hoka One One Rapa Nui Trail Runner, Road Too! Hoka One One (Europe site showing Rapa Nui Comp trail and Kailua Comp road models) is well know for launching maximalist, super cushioned running shoes while most other shoe companies veered towards minimalist barely there shoes. I have run in Hoka's original Mafate, the Bondi, and most recently the Evo Tarmac. All of these shoes feature a minimum of 30-36mm of cushioning and an approximate 6mm heel to toe drop. Stiff, fabulously cushy, and surprisingly light I have found them to be a great shoe for recovery, long runs, and any kind of downhill. I just couldn't seem to take full advantage of the rocker sole profile when tired tending to get back on the heels. Enter more "minimal" Hoka, the Rapa Nui Trail and Tarmac. 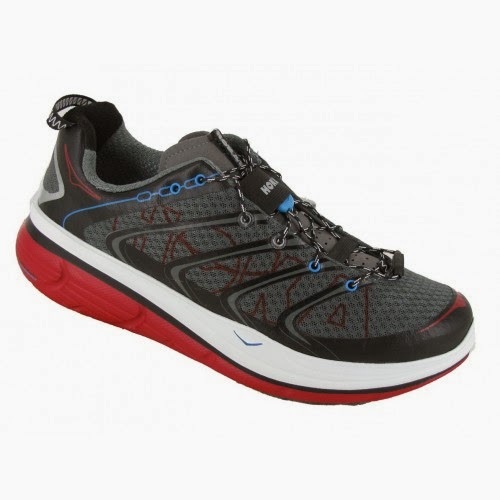 Update: Boulder Running Company has an early US release of the Rapa Nui Trail (model I have) and Rapa Nui Tarmac (road version) both $129.95 available today November 20th, 2013. Update 1/20/14: the Rapa Nui is now the Rapa Nui 2 and more broadly available in the US. Biggest change a new upper that does away with the burrito toe area shown below replacing it with a seamless toe box area. Midsole and outsole construction and thus the ride appear the same as described below. 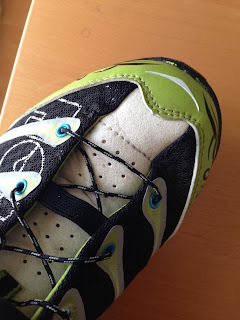 A fine review of the Rapa Nui 2 by fellow NH blogger Nate Sanel over at Runblogger. Height: 20mm forefoot height/26mm heel height: 6mm drop. About the same as other Hokas. Weight: exactly 10oz for my size US 8.5 so likely about 10.3oz for standard 9. At least an ounce less than the comparatively svelte (for Hokas) Tarmacs. Upper: Mesh with welded overlays. Unlike many 2013 shoes there is still stitching particularly in the toe box area. This likely adds to weight. The tongue is a thin suede like material with a bit of mesh cushion on the inside. Similar to the Tarmac's tongue but thinner and softer. The tongue (white in picture) extends almost all the way to the toe, unusual construction as part of the toe box is actually the soft tongue. The sides wrap around the foot and over the tongue like a burrito up to the stitches by the toe. I believe this helps with overall flexibility but means several seams over the toes. These seams have not been an issue at all so far. Fit is comfortable with decent forefoot volume if a bit narrower than Tarmacs. True to size with my high arch, narrower feet wearing thin socks. Update: The new version of the Rapa Nui now coming on sale in the US has a new toe area construction. The somewhat complex "burrito" construction with many seams is replaced by a open toe box. Midsole: EVA as other Hokas but at 1.5x volume vs. 2x volume for older models. The Rapa Nui has injection molded EVA (IMEVA) vs. the compressed EVA in all other models for what is claimed to be a more responsive feel and more rebound. I think this is true, if subtly and may also contribute to the fact they also have more forefoot flex by far than other Hokas I have run in. The midsole extends up and around the upper to create a "bucket seat" for the foot, a signature of all Hokas and what also creates the illusion they are far off the ground and somehow not stable, not true. Outsole: Decent lugs for most trail terrain. Lugs are are not noticeable on the road. Harder rubber (black) in heel and toe areas. I am seeing some accelerated wear in a few of the heel lugs as I have run many miles on the road. Par for the course for Hokas. The Shoe Goo may come out in a month or so...Carved out areas in the midsole for increased flexibility, and these Hokas flex in the forefoot as well as any trail shoe, a first for Hokas. Overall geometry: overall width of outsole is narrower at heel and forefoot than Tarmacs. This is positioned as a racing Hoka. Far more flexible than other Hokas. The rocker effect is less pronounced. I have run 190 miles so far [Update: 300 plus miles] in the Rapa Nui, about 150 road miles. Still very much the cushioned like running on grass while on the road Hoka feel. A bit surprised that they felt almost as cushioned particularly in the heel as Tarmacs which have about 10mm more of foam cushioning front and back.Of course super cushioned even more so than the adidas Energy Boost I reviewed earlier but responsive and smooth in a way similar to the new Pearl Izumi E:Motion Trail N1, also reviewed here yet without nearly as much of what is almost a too firm road trail feel. At the forefoot they generally feel as flexible as a "normal" running shoe and the characteristic rocker effect of other Hokas is far less noticeable. I have not had the occasional metatarsal pain at my big toe that I have on occasion experienced with the Hoka Mafate and Tarmac. The soft forefoot cushioning and flexiblity seems to lack a bit of stability on the very technical rocky, rooty NH trails of my first trail run. A band of denser rubber outsole on the outside of the forefoot to the midfoot such as on the New Balance 1210 Leadville or or an embedded rock plate, web or frame of plastic such as in the Inov-8 or my adidas Energy Boost could help make them a bit more stable. I have run and hiked about 90 miles on the smoother less technical trails in UT and the RapaNui climb far better for me than other Hokas. Much more trail feel with no rock push throughs despite no rock plate. Not quite the bomb proof downhill performance of "traditional" Hokas but nonetheless very smooth over obstacles. At speed on the road they felt great. I did a test 3 days apart on essentially the same 6 mile course running at a moderate easy pace for 5 miles then clocking a fast last mile on a Strava segment. First run was in Nike Lunar Fly racing flats from several years ago. Second run in the Rapa Nui. I was overall 50 seconds per mile faster , I did push a little harder on the easy miles the second time, but more significantly my last fast mile was to the second identical to the prior run and a segment record for me, with less perceived road shock and effort. I think the Rapa Nui will, given their lighter weight, lower profile, and flexibility be a faster shoe than prior Hoka models and a good candidate for my mostly downhill fall St. George Marathon as well as Park City's Jupiter Peak Steeplechase with its 3000 feet of climbing and then fast downhills. I believe as with all Hokas this is a great shoe for folks struggling with injuries such as PF or worn out joints. Given the flexibility I believe Rapa Nui's is a more responsive uphill trail running shoes than the bigger Hokas. As slope increases and the rocker angle of traditional Hokas is exceeded (about 10 degrees) I have found you need to have plenty of knee lift to drive up and forward. Last year I ran most of my trails in Tecnica X-Lite, a lower profile close technological cousin to the Hokas, a great shoe but quite heavy and with a somewhat loose upper. As far as downhills Rapa Nui have the great confidence building Hoka cushion on a somewhat narrower less stable platform but also have greater responsiveness and terrain feel than its beefier cousins: Mafate, Stinson, and Tarmac. A little less of the Hoka "cloud", more flexibility, less weight. 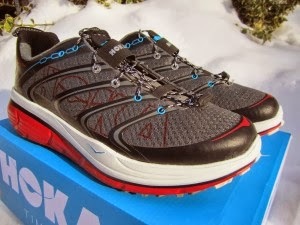 What I have been waiting for from Hoka in a longer run trail and also road runner. A true hybrid good for anything you can throw at them except maybe a 5K-10K road race with no compromises for road, trail, and hiking. I think they are a tad narrower at the insole level where upper starts but due to wrap around upper and soft tongue almost all the way to the tip of the shoe they seem to have more vertical volume and maybe more room than the Tarmac. So far seem a touch less constricting than Tarmac overall up front. Nonetheless an Altra wide toe box they do not have! So, would this be the best Hoka for a strictly road runner, in your opinion? There is another model, very similar called the Kailua Comp coming from what I hear. Has a more road specific outsole and is a bit ligher. If you are looking for a Hoka that is "more like" a conventional road shoe, ie more flexible less reliance on rocker these 2 are it. I have the Bondi model right now and really like them. This new one is interesting. My question is based on you running in both this one and the Tarmac (which I have tried and did not really care for) is the cushioning really different. I have a bad knee and the Hoka is a godsend to help me keep running. I just want to make sure this one will do the same job. Thanks. Harris, there is a bit less cushion for sure but still a Hoka, more noticeable in the forefoot than heel area The big difference is that the Rapa Nui is far more flexible in the forefoot than Tarmac or other Hokas. They run more like a conventional shoe with less of the rocker in play. For me they run faster so you might mix them in for faster runs and races. All depends in the end how fast you typically run and also how strong you are, knee lift and drive. When I get tired in Tarmac I tend to go too far back on the heels. Sam, thanks for your comment. I had one other question all of my trail running requires going on the road to the trail. How have these performed (if you have tried) on the road to trail? Harris, so far with the exception of one very technical trail run all my miles in the Rapa Nui have been on the road. Superb road shoe. Seeing a bit of wear on the rear most heel lugs sooner than one might expect. As far as trails it depends on your terrain. Here in NH the trails are extremely rocky and rooty and I found the midfoot a bit more unstable than what I like for these trails. I will soon will go to UT where the trails are by and large much smoother and I am confident Rapa Nui will be perfect. Where do you run? I run single or double track in California. Going to run some trail stuff in July in Hawaii (looking forward to that). Thanks for your comment. I ordered a pair and will have them this week. I only hope they will help my knee like the Bondi does. If so, I may have found the perfect shoe. Neal, My Tarmacs are 8.5 as are my Rapa Nui so true to size for me. I have narrowish feet. My sense is the Rapa Nui due to its "burrito" construction almost to the toe: both sides of upper wrap around tongue almost to the toe are slightly wider and have more room to the toe or at least can be speed laced for more room. I wear thin but not the thinnest socks, lightly padded toe and heel lighter rest of sock. If I did ultras or wore heavy socks I might size up half a size. Is the cushioning of this shoe noticeably less than that of the Bondi B shoe? I've run in the Stinston and Bondi B, both are great shoes with unbelievable cushioning but because of their heel height are prone to ankle rolls on trails. Some people might not have a problem with this but I have thin ankles and even small rocks can give me problems. I'm looking at this shoe and the upcoming Altra Olympus as possible shoes to take on the trails. The cushioning is not in my view noticeably less than the Bondi or Stinson. What is different is that the Rapa Nui has some flex in the fore mid foot which the other 2 don't have much of. So, while it still has a rocker sole it runs far closer to a "normal" shoe. Rapa Nui is closer to the ground. This said as the forefoot does flex and the cushioning is still soft I sometimes find they are a little less stable in forefoot on technical downhills than the other 2.
hi sam. thanks for the great reviews. i wondered how you would compare the rapa nui, clifton, and huaka. since the rapa nui weighs 3 ounces more than the clifton, does it have any advantages? firmer/more responsive? (it's cheaper at the moment.) the huaka seemed too wide for me. looks like rapa nui and clifton have a similar fit. i haven't used hokas before. Hi Bruce, Thanks for reading! I ran in the first generation Rapa Nui. At this point I would say Rapa Nui is an older generation shoe when compared to the Clifton and Huaka which are both far lighter and just as well cushioned. I found the forefoot soft on trails with RN, not nearly as stable as the Huaka which of the three is the firmest...in a Hoka way... and most stable. The Clifton upper fits for me a bit better than the Huaka. The Huaka due to the extra lace hole up front fits narrower and snugger with a little bit less stretchy mesh, more a race fit and thus its stability in part. The Clifton is very soft in the heel, softer than Rapa Nui and for sure Huaka which has a different midsole material RMAT anyway. In part also soft due to the deeper heel rocker on the Clifton. Still a very fine shoe especially if you can stay on your midfoot. thanks, sam! do you feel the new hokas are on another level from, say, the skechers ultra? does the ultra (or the ride) fit very loose? might the skechers be easier for someone like me, who hasn't run in any maxi-pad shoes, to go back and forth with my "regular" shoes? and finally (well, maybe not), do you feel there's good reason for a runner who rarely goes more than 10-12 miles to use super-cushioned shoes? switching gears, do you have any experience of the changes to the second versions of energy boost and adios boost? sorry for the multitudinous queries. many thanks. Bruce, no problem on as many questions as you want. the Skechers GoRun Ultra and ride have about the same softness midsole as the Clifton and are softer than Huaka. In both there is less height so while the materials are as soft or softer a bit firmer than the Clifton. I found the GoRun Ride a bit looser fit than Ultra maybe mostly because of the slightly stiffer upper materials in the GRU as I think the last is the same. The GRU and Ride are more flexible overall especially forefoot. The GRU and GRR is really a great shoe and a great $ value but if you use them on road the midsole as outsole will wear fairly fast and a a bit faster than the Huaka and Clifton which do have rubber wear pads. The GRR has harder rubber wear disks. As far as do you need super cushion in your rotation I say absolutely at a minimum for easy days and long days. Mix things up and your legs will be happier. Next day I am never tired after a run in Hokas. i find it hard to run as fast in the Hokas than conventional shoes but the Huaka and Clifton as well as GRU have relatively little penalty compared to the older Hokas. I have experience with Energy Boost 2 vs 1, the upper is the big change and it is less tight overall better. Jury out on Adios Boost 1 vs 2 . I have only run in the 1 and tried the 2. The upper on the 2 is like the Boston Boost on a narrower last and I think I will miss those overlays and support that make the 1 so well supported and directed. I also hear that the AB2 is a bit narrower and many size up half a size. Hope all this helps. thanks again. (be careful what you give a green light for!) re energy boost: do you think the fairly extreme toe spring could cause problems for some runners? does the shoe's stiffness make it problematic for running easier trails? (though apparently some top trail runners use adios!) do you feel energy boost could serve pretty well as a super-cush recovery-day shoe? btw, i have a (light, fast--1:10 half-marathon) friend who has over 1000 miles on energy boost 1. he's only thinking of retiring them because he's tired of hearing the scraping of the torsion plastic where the outsole around it has worn down! i'm very tempted by the adios boost 1, but i assume they're not really going to work as a trainer for a not-fast runner like me. The rubber outsole on Adios Boost and Energy Boost is simply outstanding. Not super hard but wears like iron. Heel area well designed with its "rudder" on Energy to off load or smooth the landing and wear. As far as toe spring less noticeable on Energy than Adios. I really like the snap of the Adios at speed. Slower not quite as much. do you find the upper and fit of adios boost 1 (still available) very similar to energy boost 2? Bruce, very different uppers. Similar fit with Adios a bit snugger. Energy Boost upper like a semi stretch sock, more fabric like than mesh in Energy Boost 1. SAdios Boost 1 similar fit but more structured especially in forefoot. Mesh and not particularly stretching to hold and align the foot at speed. Hi Bruce, I ran in V1 of the Rapa Nui, trail. It was fine on the road. Actually preferred it on road than trail. $68 a great buy. The forefoot was not as stable on downhills soft as other Hokas I ran in Mafate 1 and Stinson 1. 1. Huaka a better shoe all around, road and trail. While upper is not great it worked fine for me with regular laces. For such a light shoe stable and responsive in all surfaces except maybe rough trails. As with most Hokas traction and outsole lug wear so so. Quite similar in many ways, light soft cushion. The GoRunUltra would be a softer ride, more flexible, and a touch less supportive upper. The foot sits down in the midsole in the Rapa Nui. For trail use at least the way I run not very nimble the Rapa Nui wold be touch more stable in forefoot on downhills but not much more. do you think the road version of the rapa nui would feel better and last longer on, um, the road than the trail version would? Bruce, I have not run in toad version of Rapa Nui. Generally Hoka "lugs" are soft and low profile so for me not really that noticeable on the road and as you know they wear quite fast being soft.